A brand lives, and holds power, in the mind of it’s customers. It is triggered by a number of elements in which customers are exposed to and gained direct knowledge of the brand. Those elements are the ones differentiating one brand from another and determine the range of space a brand will have while occupying one’s mind. They continuously evolves along with the way a brand positions itself, while at the same time still holding it’s core values. People associates those series of elements with the brand, like one would of an aspects of a human with the person holding an identity, and therefore, also called as brand identities. Aaker defined brand identities as a set of associations a brand strategies will use as foundations of the firm’s strategic plan. It serves as the firm’s purpose and what it stands for while reflecting the ‘promise’ of a brand. A brand identity acts as the soul of a brand—the way a firm wants to be perceived as, translated into various elements of identity trademarked devices. Brand names, URLs, logos, symbols, characters, spokepeople, slogans, jingles, packages, and signage are a part of a brand identity with their differing characters. Ghodeswar defined those devices as ‘extended identity’ of a brand, developed from it’s core values. Because of it’s broad definition, many people apprehend brand identities the same way as brand images, whereas in fact, those two aspects stand on different perspectives. Brand images are based on people’s perceptions of a brand that needs to be handled tactfully. On the other hand, brand identities are based on the firm’s visions and perceptions of a brand that will be translated into strategic means. A brand image tends to look into the past, whereas a brand identity looks into the future. The brand identity should also reflect the brand’s enduring qualities, even if they are not salient in the brand image. Like any identity, it represents the basic characteristics that will persist over time. A firm defines it’s own brand identity to keep the company’s strategic plans on the same track. Brand identity is the foundation of all strategic plans, and therefore, plays a big role in building brand equity. This function can be maximized with the use of suitable brand elements that will differentiate their brand from another while triggering a segmented market’s emotional aspects. In doing his role, a brand strategist tends to find the suitable combination of the brand elements. The effectiveness of brand identity depends heavily on the cohesiveness of those elements. Brand identity forms a series of strategic plans that can be identified to be a three or four steps model. Aaker divides brand identity implementation system into a three steps process—brand positioning, execution, and tracking. Brand positioning includes placing brand identity as a value proposition towards it’s target audiences and planning it’s communication strategies. The second process, execution, includes the production of brand elements and it’s devices. The last one, testing, acts as an evaluation and control system of the execution process. The three steps model can be seen as basic steps in a strategic planning system. The PCLD Model, on the other hand, divides the brand building model into four steps. The letters forming the name of the model itself stand for each of those four steps—positioning the brand, communicating the brand message, delivering the brand performance, and leveraging the brand equity. Positioning here stands for the creation of consumers’ perceptions of the brands, which differentiate itself from others. The second step, communicating the brand message, is based on how the brand positions itelf in the first step. The positioning then will be translated into visual and verbal aspects in the forms of advertising campaigns, events, and others. The third step, delivering the brand performance, is quite similar with the last step in the previous model. In third step, the firm monitors and evaluates brand performance through customers’ satisfactions and other aspects. Last, leveraging the brand equity, is an action required to widen the brand’s potential market. This process can be done by brand extensions and other branding strategies. While in the process of building a brand, brand strategists must constantly evaluate the identity brought in each step. 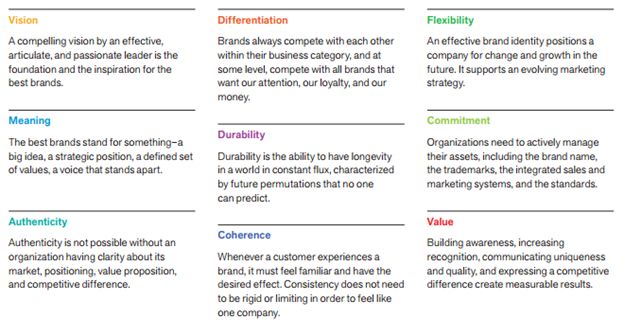 Alina Wheeler points out nine ideals that should be developed in brand identity. 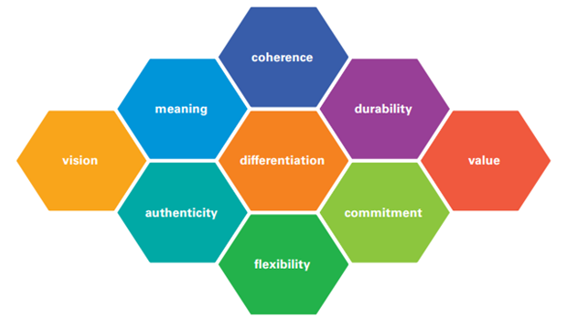 These ideals includes coherence, durability, value, meaning, differentiation, commitment, vision, authenticity, and flexibility. In short, brand identity should be able to differentiate itself from other brands in the same category, while having a compelling vision, equipped with big authentic ideas that reflect brand values that grows alongside the firm’s elements, coherently acts as a foundation of strategic plans, and is able to produce longevity enabling the brand to lives strong long enough within the world’s constant flux. Keller proposed a more technical approach in seeing the ideals of brand identity. He listed six criterias that should be used by brand strategists in forming an effective brand identity—memorable, meaningful, likeable, transferable, adaptable, and protectable. A brand identity have to come from the values it serves, formed as an idea that can communicate personally with it’s customers while having interesting elements which can build memorable and likeable experiences for it’s target.. At the same time, it has to be able to build a transferable system, enabling it to widen it’s market through expansions and extensions while adapting to customers’ constant changes in preferences and characters, yet have legal and cometitive foundations to protect it. Ghodeswar, B. M. (2008). Building Brand Identities in Competitive Markets: A Conceptual Model. Journal of Product & Brand Management, 4-12. Madhavaram, S., Badrinarayanan, V., & McDonald, R. E. (2005). Integrated Marketing Communication (IMC) and Brand Identity as Critical Components of Brand. Journal of Advertising, Vol. 34, No. 4, 69-80. Temporal, P. (2010). Advanced Brand Management: Managing Brands in A Changing World. Clement Loop: John Wiley & Sons, Inc.
Wheeler, A. (2009). Designing Brand Identity: An Essential Guide to The Whole Branding Team (Third Edition). Hoboken: John Wiley & Sons, Inc.
 Alina Wheeler, Designing Brand Identity: An Essential Guide to The Whole Branding Team (Third Edition), (Hoboken: John Wiley & Sons, Inc., hlm. 2. Kevin Lane Keller, Strategic Brand Management: Building, Measuring, and Managing Brand Equity, (Essex: Pearson Education Limited, 2013), hlm. 69. David A. Aaker, Building Strong Brands, (New York: The Free Press, 1996), hlm. 68. Duane E. Knapp, The Brand Promise: How Costco, Ketel One, Make-A-Wish, Tourism Vancouver, and Other Leading Brands Make and Keep the Promise That Guarantees Success, (New York: McGraw-Hill, 2008), hlm. 12. Kevin Lane Keller, Op.Cit., hlm. 142. David A. Aaker, Op.Cit., hlm. 70. Philip Kotler, Hermawan Kertajaya, and Iwan Setiawan, Marketing 3.0, (Hoboken: John Wiley & Sons, Inc., 2010), hlm. 30. Kevin Lane Keller, Op.Cit., hlm. 167. David A. Aaker, Op.Cit., hlm. 79. Bhimrao M. Ghodeswar, “Building Brand Identities in Competitive Markets: A Conceptual Model”, Journal of Product & Brand Management, hlm. 6. Alina Wheeler, Op.Cit., hlm. 31. Kevin Lane Keller, Op.Cit., pg. 142.